Sophia Hastings, an artist whose subject matter increases the prejudice she must confront as a woman artist, is one of the four bluestockings who has inherited Beauchamp House. However, as the story opens, she has been inspired by the coastal beauty of the Beauchamp property and is trying to capture her vision of it. So absorbed is she in her work that she is startled by the sound of men’s voices and falls off a cliff. She is doubly fortunate. Her only injury from the fall is a twisted ankle, and help is quickly available in the person of Little Seaford’s angelically handsome vicar, the Rev. Lord Benedick Lisle. But before the vicar can help Sophia back to Beauchamp House and medical help, the two overhear an ominous argument between two men whose voices they cannot identify. It is clear that they have stumbled into a dangerous situation. The vicar is determined to protect Sophia from involvement in the investigation, but both Sophia’s sense of justice and her curiosity make her equally determined to be involved. Sophia has also been charged by her beloved Aunt Dahlia to do all she can to interfere with the plans of Little Seaford’s newest resident, one Peter Morgan, a corrupt industrialist who has moved to the area with the idea of using his ill-gotten wealth to secure a seat in the House of Commons. Soon Sophia and Ben discover that art forgery is another thread in the dangers that threaten the village. The more time Sophia and Ben spend together, the greater the attraction between them grows. Ben respects Sophia as an artist and admires her independent spirit, but the unconventional Sophia has doubts that she is a suitable match for a vicar. 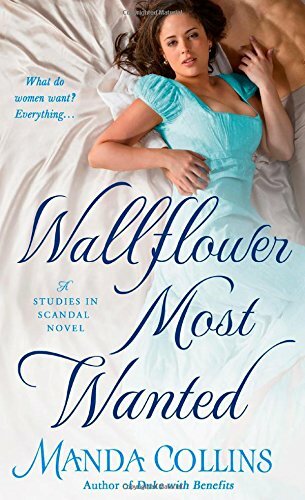 Wallflower Most Wanted is the third book in Collins’s Studies in Scandal series. Like the other two, it combines romance and mystery in a balanced, satisfying blend and links the particular mystery to the bluestocking heroines’ benefactor. I always find artist protagonists interesting, and with Sophia, her history as the daughter of neglectful parents and the role Aunt Dahlia plays in her life adds to the interest, as does the close relationship between her and her sister Gemma. But it was Ben who made this book for me. I have a great fondness for vicar heroes, and I adore the Lisle brothers. I also enjoy series that belong to the same world as earlier series. I was delighted that Ben’s brother Freddie, hero of A Good Rake Is Hard to Find (Lords of Anarchy 1) and my favorite Collins hero, plays a role in this book. So, Ben was a winner for me on several counts. I also appreciated that he and Sophia genuinely like and respect one another. Their differences keep things interesting, and their commonalties make them a believable couple. I can easily imagine them enjoying a long, happy life together. I count on Collins’s books to provide enough mystery to challenge me without ever letting that element overpower the romance. She does it again in this book. I’m also a big fan of clever twists, and I admit I cheered when the taboo-shattering murderer was revealed. If you like historical romance that combines mystery and romance with flashes of humor and some sizzle, I recommend this book. Readers can expect to see more of another Lisle brother in Gemma’s story, One for the Rogue, scheduled for release on June 26. 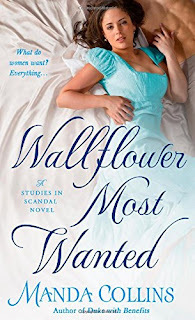 He is Gemma’s hero, and I’m sure he will prove to be as much of a heart-stealer as his brothers--although I’m not sure if his name is Cameron (Wallflower Most Wanted) or Camden (cover copy for the new book). I've been enjoying this series, and looking forward to this one. I hope you enjoy it as much as I did, Diane. Thanks, Janga! I'm reading this book now and thoroughly enjoying Sophia and Ben. They are a great couple, aren't they, PJ? The Good Reverend Lord Benedict was a treat, as was Sophia. I loved the depth they were given here. San, don't you think there is something especially rewarding about seeing such winners from authors in whom we believed before they were published? I've enjoyed her books - thanks. I think you will enjoy this one too, catslady. Thank you for the lovely review, Janga! And for catching the name mistake in the back cover copy. Would you believe I read through it several times and didn't catch it??? 🙃 Mea Culpa. It will be fixed before the book comes out. Janga, I like this series, and like you I especially liked Ben. I definitely <3 Ben, Annette! I have only read one of her books, but by the sound of this review and book description, I need to read many more. I need to read the Lords of Anarchy then start the Studies In Scandal Series.